Nearly 50 countries will become 'super-aged' by 2050, joining Japan, where already more than 30% of the population is over 60. Besides the general concerns of the socioeconomic effects of this trend and the ability of countries to provide sufficient support for their elderly populations, it also offers opportunities, especially for businesses. 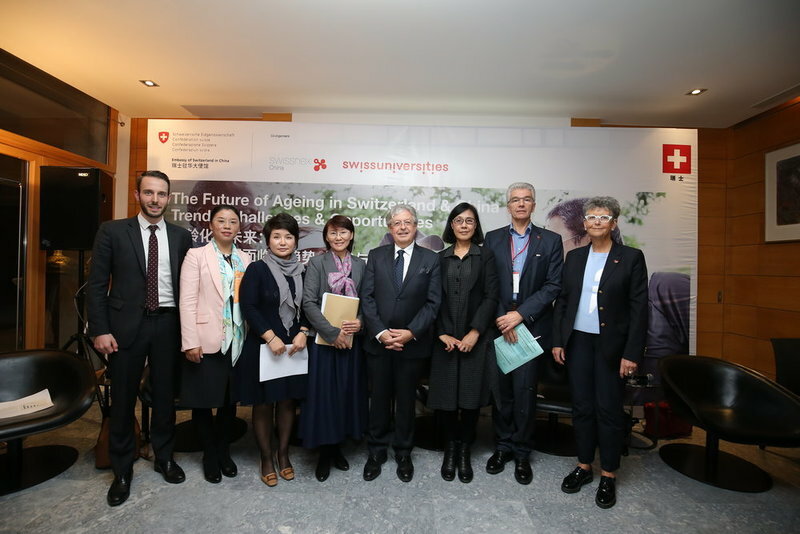 This event, which has been produced for on-demand access, will help you identify common challenges, research and technology trends, as well as collaboration opportunities for Switzerland and China towards healthier ageing. H.E. Dr. Jean-Jacques de Dardel is Switzerland’s Ambassador to the People’s Republic of China, Mongolia and the Democratic People’s Republic of Korea. Previously, he served as Ambassador to the French Republic, the Principality of Monaco, UNESCO and the International Organization of La Francophonie until 2014, Ambassador to the Kingdom of Belgium and Head of the Swiss Mission to NATO until 2011 and Assistant Secretary of State for Europe, Central Asia, the Council of Europe and the OSCE until 2007. Dr. de Dardel’s 35-year career in the Federal Department of Foreign Affairs includes postings to Washington, Canberra and Vienna. Originally from Neuchâtel and Nendaz in the French-speaking part of Switzerland, Dr. de Dardel holds a Master’s degree in Economics from the University of Geneva and a Ph.D in Political Science from the Graduate Institute of Higher International Studies (now IHEID) in Geneva. Heidi Longerich is Vice Dean of the School of Health Professions of Zurich University of Applied Sciences. She was invited to build the School of Health Professions and the Institute of Nursing after she was responsible in the government of the Canton Zurich for the re-engineering of the professional education for health professionals, such as Physiotherapy, Occupational therapy, Midwifery, Nursing and others. From 2000 to 2002, she was at the Institute of Nursing, University of Basel, Switzerland in cooperation with the Royal College of Nursing London, Great Britain, and carried out the Clinical Leadership Project. This program enabled Nurse Leaders in transformational Leadership. Previously, she was Acting Director of different acute care hospitals in and around the City of Zurich. Henk Verloo holds a Masters in hospital sciences, tropical medicine, palliative care and Ph.D in nursing sciences. He is a professor at the University of Applied Sciences Western Switzerland and invited Professor at the University of Lausanne at the faculty of Biology and Medicine, where he teaches geriatric nursing care at the University Institute of Education and Care Research (IUFRS-UNIL). He is also active as a clinical and research expert in the Department of Old Age Psychiatry at the University Hospital of Lausanne. His research focuses on nursing interventions to improve delirium, cognitive impairment and frailty among hospitalized and home dwelling older adults. Current projects include the Senior Living Lab, acceptability and use of gerontechnology among home dwelling older adults, informal caregivers and community health nurses with the aim to keep older adult as long as possible at home and the implementation of Evidence based-practice in healthcare settings. Yi Pan is a senior researcher of Social Policy in Institute of Sociology, Chinese Academy of Social Sciences (CASS) and a professor at the CASS graduate school. She is the Deputy General Secretary of the Social Policy Centre at CASS and Deputy General Secretary of the Social Welfare Academical Association of China. She graduated from Beijing University with a BA, received her Mssc from University of Tampere, Finland, and a PhD from the University of Cambridge, UK. She is a board member of the Committee of China Charity Alliance, a board member of Council in China Association of Gerontology and a board member of Committee in China Family Culture Academic Association. Before that, Pan Yi was a Senior Researcher in the Ministry of Civil Affairs in China for more than ten years. In 2013, she also worked at the European Commission's Directorate General for Employment, Social Affairs, on behalf of CASS. Her expertise is in social policy, welfare state models, social services and elderly care. YU Lixin, CEO, Muze Group and Yyk Healthcare (Beijing) Co.
Ms Yu is the CEO of Muze Group and Yyk (Beijing) Health Care Co. Ltd and was also the Founder of PISCES Healthcare. She has over 20 years of entrepreneurship experience in the application of software, hardware and system integration in healthcare industry, creating success stories in the integration of health management and digital healthcare into smart city and smart community. “Smart community elderly care and healthcare coaching center” is one of her most successful projects to mobilize innovative technologies and business models with existing healthcare resource at community level. The center combines online and offline services to provide the elderly with daycare, chronic disease management and healthy lifestyle guidance to local residents. Mrs. Yu holds a doctoral degree from Beijing Normal University and a Masters degree from International Technological University, California, USA. She serves in many government and social organizations, including Beijing Municipal Committee of the Chinese People’s Political Consultative Conference, Beijing Association of Female Entrepreneurs, etc. Ninie Wang is Founder and CEO of Pinetree Care Group, the largest home healthcare services provider in China. She has published papers on the long-term care service model and participated in drafting senior care industry standards and policy papers in China. She is a World Economic Forum Young Global Leader, a member of their Global Agenda Council on Ageing, a Fellow of the China Fellowship Program, and a member of the Aspen Global Leadership Network. She was awarded “Excellent Young Scholar” by China Association of Gerontology and Geriatrics. Ninie Wang holds an MBA from INSEAD France/Singapore.